Have you ever considered the benefits of building an audience on Pinterest? Pinterest is one of the world’s most engaged social networks and in fact operates as a search engine that delivers valuable information to its users. It is often a channel that is neglected in favour of Facebook, Instagram, Google, Yahoo and Bing. This social media platform shouldn’t be underestimated. There are businesses that have used the platform to build up thousands of followers on the social media account, which generates them thousands (or in some cases, tens of thousands) of referral visitors every month. If you have never considered using Pinterest as a marketing channel, here are a few reasons why should consider using Pinterest in your business’s overall marketing mix. Links from Pinterest can help your site improve its SEO performance. There are some links that you can get from Pinterest that will have a positive impact on the SEO performance of your website. Pinterest is a site that is high in authority and offers a range of follow and nofollow links across the site. By sharing your content on the platform and having the content shared and ‘repinned’, your site will increase its chances of getting additional authority from those links, which will help the site improve its overall SEO ranking performance on Google. Shares on Pinterest validate the value of the web content that gets published on your website. If you want to know whether your business is producing the right type of content for your marketing campaigns, the audience on Pinterest will validate its value by sharing any pins to the content and also commenting on the content. This feedback can then be used to drive any future campaigns on social media or any other marketing channels that your business uses. The life of a pin is much longer than a share, like, tweet or save on other social media platforms. 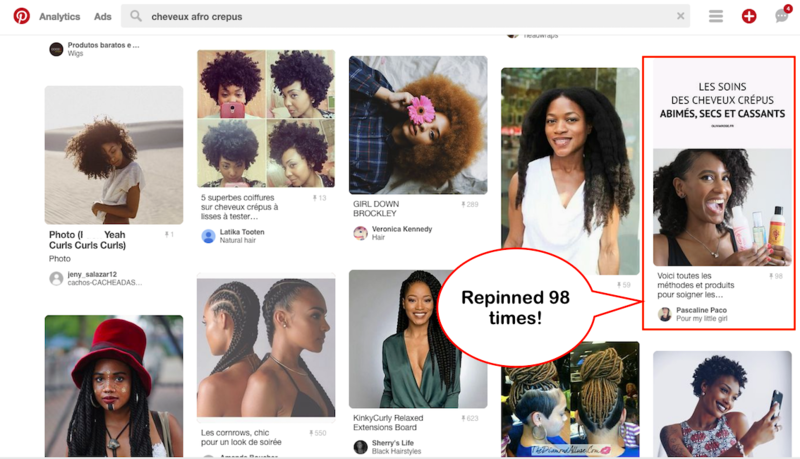 One of the great things about using Pinterest is that the lifespan of the pin is much longer than the life of something that gets shared on Twitter, Facebook, Google Plus or Instagram. The last thing that you want is to publish content that will be “here today and gone tomorrow”. By publishing a pin, the pin should gain traction over time and should be able to be discovered by others in the future. Even if you decide to promote pins, it will still remain within Pinterest’s search results and will generate new traffic, leads and potentially sales over time. You can also boost the promotion of your pin using ‘Pinterest Ads’. Although it hasn’t been rolled out globally, there’s a big opportunity for businesses to take advantage of Pinterest advertising in order to generate cheap web traffic and leads to their website. Pins to the web content can be promoted for a fee on a “cost per click” or “per 1000 impressions” basis. Keywords and audiences can be targeted to promote pins to the right target groups, who can then engage and share the web content of the pin. Some people that have used the service have seen their web traffic increase by tens of thousands of visitors every month. Currently, Pinterest ads are only available in Canada, the United States, and the United Kingdom. If your business has a Pinterest account that is registered in either of those countries, you can take advantage of Pinterest advertising. A successful Pinterest campaign can make your content go viral. Ultimately, you want your Pinterest pins to go viral among your audience. In the screenshot below, you can see how a blog post from the website Oliviarose.fr went viral and earned her several thousand web visitors from Pinterest. These visitors became qualified leads and also became customers. Your business can implement a similar strategy by applying similar Pinterest SEO and promotional tactics on the platform. How can Business Growth Digital Marketing help you with your business’s Pinterest marketing? We can implement ‘Pinterest SEO’ to ensure that your pins have the best chance to rank highly on Pinterest. Check out the case studies that we have done on Pinterest. If you would like to learn more about how you can use Pinterest to grow your business’s web presence, traffic and leads, then get in touch with the Business Growth Digital Marketing team today.